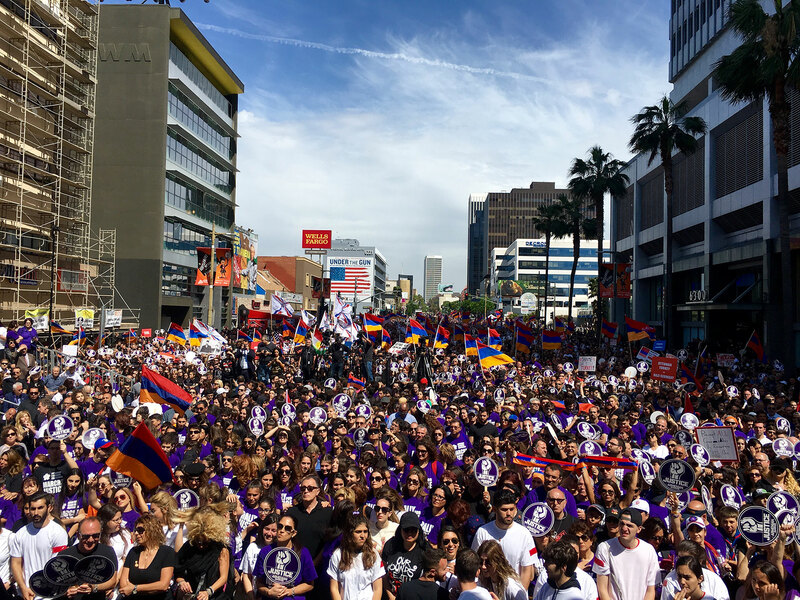 Citing the Los Angeles Police Department numbers, the Los Angeles Times also reported what organizers of the Rally for Justice, the Armenian Genocide Committee, estimated at the close of the event, which brought together the Los Angeles Armenian community. The overwhelming presence of youth galvanized the crowd, which loudly and resolutely demanded justice for the Armenian Genocide from the Turkish government with a resounding commitment to continue the struggle for the aspirations of the Armenian people. Several dozen federal, state and local officials chose to spend their Sunday alongside the Armenian-American community and joined them in rallying for justice. The program included presentations from representatives Adam Schiff, Loretta Sanchez and Tony Cadenas; California State Assembly members Scott Wilk, Adrin Nazarian and Los Angeles City Council members Paul Krekorian and Paul Korets, in whose district the Rally for Justice was being held. Religious leaders of the four Armenian denominations opened the program with a prayer, while students from all Armenian schools from Los Angeles performed the Armenian and American National Anthems. Community representatives Tamar Poladian, Krikor Moloyan and Daron Der-Khachadourian spoke during the program, with a powerful message being delivered on behalf of the youth by Joseph Kaskanian. Mistress of Ceremonies Hoory Minoyan effortlessly commanded the program, which included performances by Tro Krikorian and Ara Dabandjian, Nersik and Arabo Ispiryan, the rapper R-Mean, Armenchik and Harut Pamboukjian. Another prevailing message that was echoed not only by speakers, but overwhelmingly from the crowd was that Armenians are united in solidarity with Artsakh, which endured a massive and savage attack by Azerbaijani forces in the beginning of the month, the likes of which have not been seen since the 1994 cease fire agreement. Organizers of Rally for Justice partnered with leading Greek, Assyrian, Yezidi, Jewish, Kurdish, South Asian, Seikh organizations, as well as labor unions and student groups, whose representatives joined the community at the gathering. The message was clear and succinct, despite Turkey’s denial of the Genocide, and the US’s refusal to acknowledge history in its proper context, Armenians remain unified in the demands and will continue to pursue the Armenian Cause, until justice for the 1.5 million martyrs of the Armenian Genocide prevails. Asbarez will have extended coverage of the Armenian Genocide Rally for Justice in upcoming editions. The Armenian Genocide Committee calls upon all segments of our community to join together in a MARCH FOR JUSTICE on Wednesday, April 24, 2019, at 1:00PM at the Turkish Consulate in Los Angeles as we continue to fight for a just resolution and against denial of the Armenian Genocide.